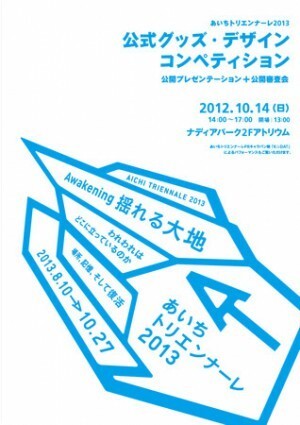 Aichi Triennale 2010, a first-time event, attracted more than 570,000 visitors and was a grand success. For the second Triennale, slated to open on August 10th, 2013, the Creative Design City Nagoya Organizing Committee will hold the Aichi Triennare 2013 Official Goods Student Competition, in cooperation with Aichi Prefecture’s International Arts Festival Section of the Culture and Arts Division of the Department of Community Affairs. Creations chosen at the public presentation by the audience and jury will be produced.